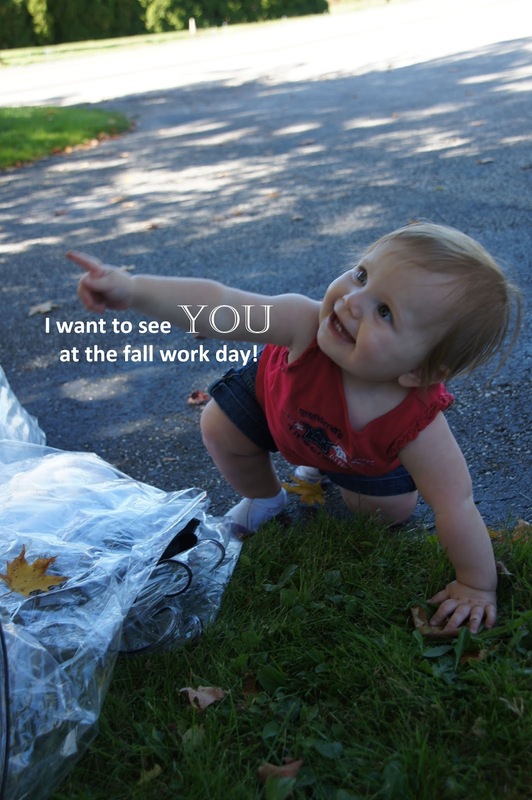 Come and join us for our Fall Work Day! 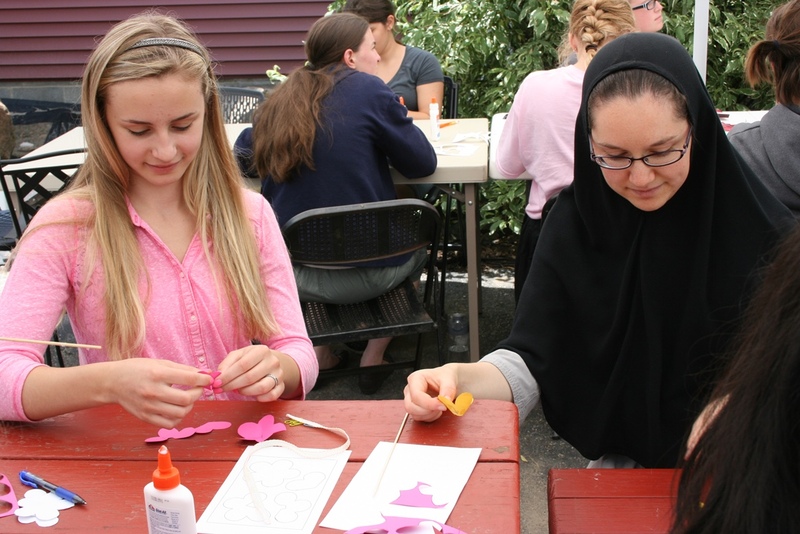 Join us for a day of outdoor and indoor work projects, prayer, food and fun at the monastery on Saturday, September 19. Volunteers of all ages and abilities are welcome! The day begins at 10 a.m., includes lunch, and closes with vespers at 5 p.m. followed by a cookout. Come at whatever time you are available, and bring a side dish to share if you can. The monastery is located at 17485 Mumford Rd. Burton, Ohio. Please RSVP by Tuesday, September 15, to 440-834-0290 or christthebridegroom@gmail.com, so that the appropriate amount of food can be prepared. We are finally getting around to sharing with you about our busy summer! This post is about our Girls' Camp, which took place in June. We are still smiling as we think about it! Twenty “Beautifully Made, Wholly Redeemed” teen girls gathered at Christ the Bridegroom Monastery for the seventh annual Eparchy of Parma Girl’s Camp, June 25-28. 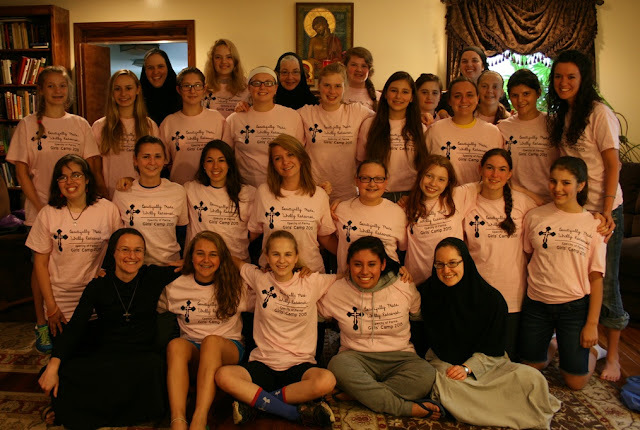 Coming from parishes in Ohio, Pennsylvania, Michigan, and even as far away as Texas, the girls came to encounter Christ’s love through the Mystery of Holy Repentance (Confession). 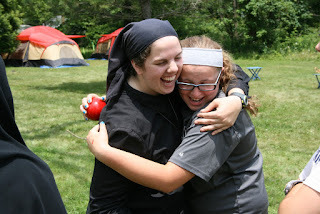 “Beautifully Made, Wholly Redeemed,” the theme of this year’s camp, emphasized the original beauty in which we were all created in infinite love and in the image of God. The girls watched the classic Disney movie “Beauty and the Beast,” which illustrated the beauty and dignity that lies deep within the heart of each one of us, and is not just reliant on our outward appearance. In our small group discussions, we looked more closely at these words from Scripture: “Not as man sees does God see, because man sees the appearance but the Lord looks into the heart” (1 Samuel 16:7). Throughout the camp, we explored the main themes of salvation history. “In the divine image He created him; male and female He created them…God looked at everything He had made, and He found it very good” (Genesis 1: 27, 31). The truth is that we are all made very good, but the lies of the devil and the fruit of sin in our lives leave us ashamed, and we hide from God. We read in Genesis that after the fall, “God then called to Adam” (Genesis 3:9). Throughout salvation history, God has been calling to each one of us, desiring to restore within us the original beauty of His creation, desiring to be reconciled with us, desiring to embrace each one of us as His beloved child. Sr. Cecilia gave the main presentation this year, explaining the Mystery of Holy Repentance (Confession) and how Confession is a renewal of our baptism. After Confession we are completely reconciled with God, as clean as a baby that has just immerged from the baptismal font. She quoted an exorcist who said, “The devil fears one good Confession more than a thousand exorcisms,” because when we immerge from the confessional we are completely pure, a “new creation.” After Sr. Cecilia’s talk, one of the girls shared that this was the first time she had truly understood what was actually happening in Confession. Mary Fetsko of Holy Transfiguration Parish in Mentor, Ohio, shared her personal testimony as a single woman living in the world, and how God has been working in her life. She reflected on how God’s mercy in the Mystery of Holy Repentance had helped her understand her own dignity and beauty in God’s eyes. Jason and Brooke Roberts of St. Francis de Sales Parish in Akron, Ohio, gave a talk about their vocation to marriage. They emphasized that love is not always a feeling but a choice you make every morning, and they also spoke about how Confession has helped strengthen their marriage. Dokimos (postulant) Moki Lonchyna shared her remarkable vocation story and how God has spoken to her of His love through prayer and the Mystery of Holy Repentance. She shared that her vocation, as is every vocation, was a response to His particular call upon her heart. 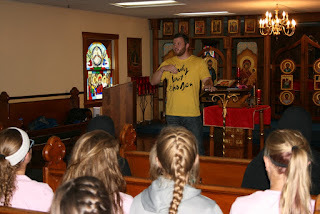 After Moki’s talk, one of the girls commented, “This is the kind of story you read in a book, but this one actually happened!” Chris Kelly, a youth minister at Sts. Robert and William Parish in Euclid, Ohio, followed with an inspiring talk about how God fulfills our desires through the vocation he is calling us to, and how the deepest desire of every woman in the desire to be loved. Our girls were not only showered with torrential downpours of God’s mercy and love during the camp, but with torrential downpours of rain as well. Our “camp” turned into a sleepover very quickly, as all the girls had to sleep in the monastery due to the rain. Although many girls lamented our flooded tents and soccer “field,” the camp remained very prayerful and fun. Our spirits were not completely dampened, and we were still able to make our crafts, share in group discussions, and get to know each other better. Before the "Year of Consecrated Life" is completed, four fifths of our monastery will take the next step in consecrating our lives to God! 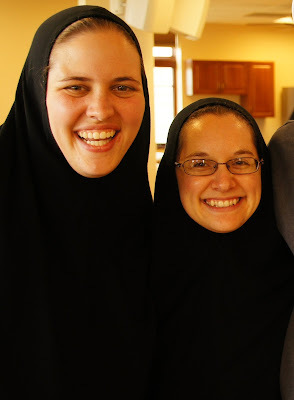 As you read in our last post, Jacqui and Moki will be tonsured as rasophore ("robe-bearer") nuns on September 7. And today, on this great Feast of the Dormition, we are overjoyed to share with you that Sr. Cecilia and Sr. Gabriella will make their life profession and be tonsured as stavrophore ("cross-bearer") nuns on Sunday, November 8! As Mary, the Mother of God, surrendered herself to God at the Annunciation as well as at her Dormition, may Sr. Cecilia and Sr. Gabriella be filled with grace in order to give their total "yes" to God and to joyfully die to the world. Please pray for them, that they may place their lives without condition into the hands of God, so that His will may be accomplished in them, bringing forth life into the world. At the Sisters' profession, they will receive additional pieces of the habit, as well as the title "Mother" to represent the spiritual motherhood that results from their union with Christ the Bridegroom. All are welcome to attend the Profession and Divine Liturgy for the Feast of St. Michael the Archangel and all the Angels on Sunday, November 8, 2015, at 2:00 p.m. at the Cathedral of St. John the Baptist, 1900 Carlton Rd., Parma, Ohio. 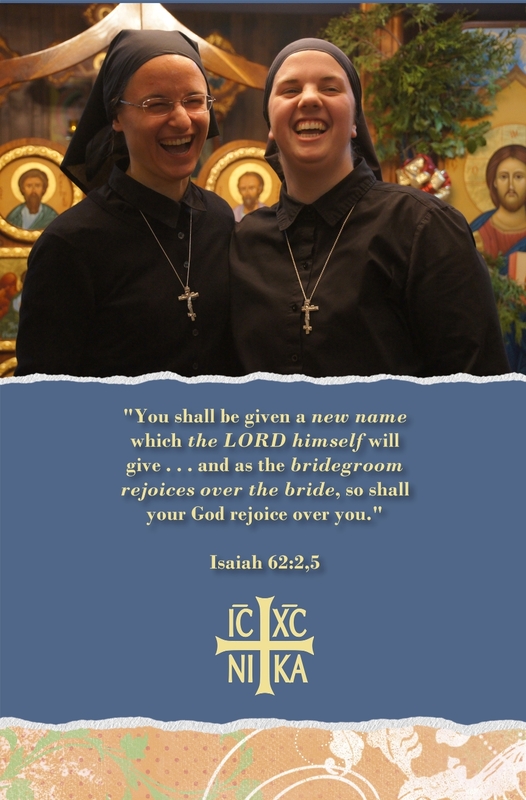 On this great Feast of the Transfiguration, we are overjoyed to announce the tonsuring of our two dokimoi (postulants) as rasophore nuns on September 7! During Vespers for the Feast of the Nativity of the Mother of God, Jacqueline and Motria will be clothed in the monastic habit, belt, riassa (robe) and skufia (hat) and receive a new monastic name. 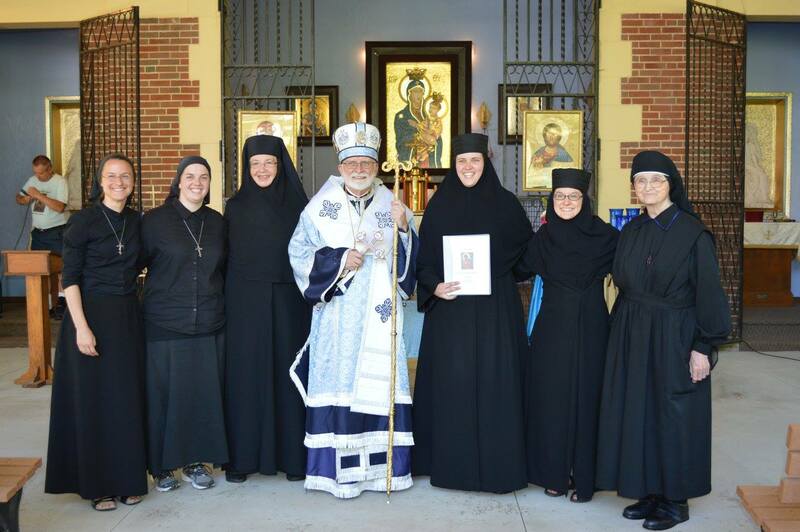 Please keep them in your prayers as they prepare for this next step in their monastic formation! "May God truly bless this undertaking and each member thereof who gives a total gift of self." Yesterday, at the conclusion of the Divine Liturgy during the pilgrimage to the Shrine of Our Lady of Mariapoch, Bishop John announced that he has established our monastery as a public association of the Christian faithful--the next step in our full canonical establishment as a monastery. He also presented each of our tonsured members with a copy of our approved Typikon (rule of life). 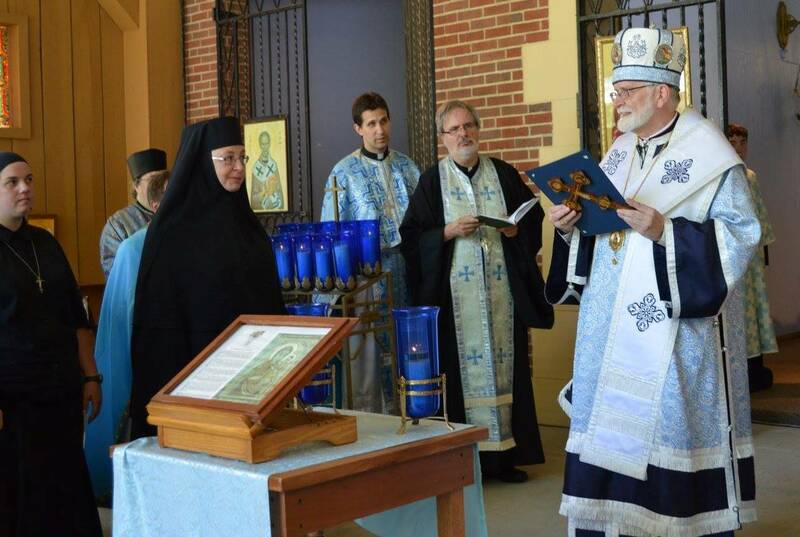 It was a beautiful moment, surrounded by so many of the eparchy's clergy and faithful! Photo: The Sister on the right is Sr. Adalberta, one of the Social Mission Sisters who formerly cared for the shrine and gave us their former residence as our monastery. Mother Theodora Strohmeyer, a stavrophore nun and spiritual mother of Christ the Bridegroom Monastery, [hereafter "the Monastery"], a private association of the Christian faithful in the Eparchy of Parma, petitions that the Monastery be erected as a public association of the Christian faithful. Having studied the petition and its supporting evidence, and reviewed and approved the proposed Typikon, I hereby erect Christ the Bridegroom Moanstery as a public association of the Christian faithful in view of being erected in the future as an autonomous monastery. As a public association of the Christian faithful, the Monastery enjoys juridic personality and autonomy of life in accord with canon 573 and 920-930. It remains subject to the authority of the bishop of the Eparchy of Parma in all those matters prescribed in the Code of Canons for the Eastern Churches for public associations of the Christian faithful. May God truly bless this undertaking and each member thereof who gives a total gift of self, giving glory to God and service to his people.